So, you have seen the Wolf of Wall Street? The Pursuit of Happiness? Think you have what it takes to rule the trading platforms and beat your friends when the bell goes off? For the first time, there is a fun trading game that allows you to go head to head with your mates. Trading Game has just launched their all-new battle feature, think Pokémon but powered by riches and fame. Going head to head in the new battle feature will sort the wheat from the chaff and will finally give you the opportunity to shut Richard from accounts up about his trading prowess. Put your friends in their place and prove to the world that when you go to battle, you always emerge the trading king! Put your pride on the line and go toe to toe for supremacy. We all know that politics affect the value of the stock, right? Well, Trading Game gives you an insight into just how quickly even a tweet from a President can put your trading portfolio in Booneville. Next time Kim Jong Un makes a threat against the US, switch on your app and start making some smart investment choices. Everything is in real time with real-life situations having the potential to make you into a trading hero. Be sure to check the oil prices when there is a war breaking out and check out how much Elon Musk’s rhetoric propels his Tesla stock. See if the electric car buzz will surge through the entire stock exchange. To be a Trading Superstar you will need to master the trading world. Trading Game gives you trading quiz questions in real time as you are making your deals. Get a question right, and it can catapult you to superstardom, get it wrong, and your best mate might just pip you to the post when that last deal comes in. Trading Game has an immersive and interactive world of education that awaits you. Trading Game puts proven university level training at your fingertips, even delving into the murky waters of Crypto-Currency so that you have a head start on which Crypto could be the next Bitcoin! Your strategy is crucial to outperforming your friends; with a wealth of stock available to you all; it is only a matter of time before someone makes a savvy investment. Or, stumbles onto a little stock goldmine! Make sure you keep ahead by tracking the markets, buying and selling at the right time and using those investment tips to bury your buddies. Trading Game gives you the bragging rights and will keep your mates pestering you about how you did it. 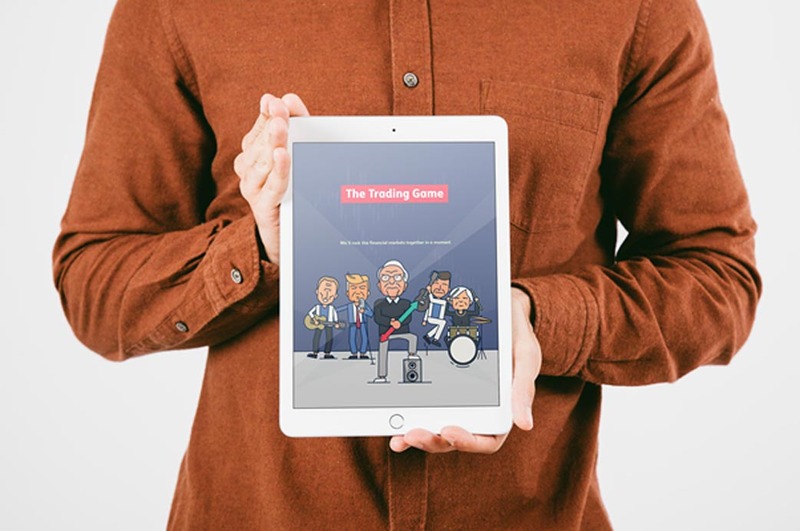 Trading Game combines a seamless and easy to use interface with all the trading and stock know-how from its creators which comes with years of successful trading experience, in fact, it is reckoned you could improve your real-life trade performance by up to 73% simply by having a bit of fun and playing the game!